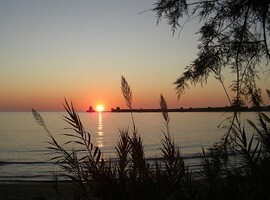 Methoni is a village in Messenia of Greece and is the perfect place to have a well earned vacation. With the beautiful breathtaking sandy beaches, restaurants, taverns, hotels and its historical castle the village is one of the leading tourist destinations and it’s no wonder the industry dominates other sectors such as agriculture which comes second. 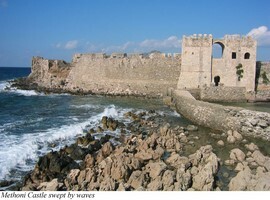 Located just a short drive from the beautiful town of Pylos, the castle of Methoni is a magical sight to behold. Standing mighty and high imposing its unending glory, this Venetian styled castle covers a vast area of land as it overlooks the sea. The entrance accessed by a stone bridge is still intact and one marvels at the great work the technicians did when they built it. The walk towards the habitat is no less than magical, the historical essence is so remarkable the inside walls are able to display it. The promontory that’s just out into the sea is a sight to withhold, with the water gushing through and under the drawbridge causing a scene that is out of a fairy tale story. 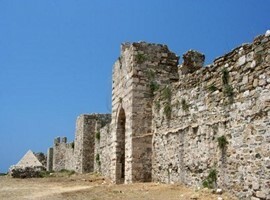 Nowadays the walls of the fortress, even though in ruins, continue to be impressive. 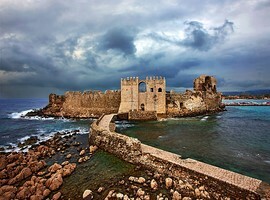 The castle of Methoni is located in the entire area of the cape and the southwestern coast to the small islet that has also been fortified with an octagonal tower and is protected by the sea on its three sides. Its northern part, the one that looks to the land, is covered by a heavily fortified acropolis. A deep moat separates the castle from the land and the communication was achieved by a wooden bridge. Its entrance is roughly in the middle of the northern side and is accessed by a stone bridge of 14 arches, that was built over the moat by the technicians of the ‘’Expedition scientifique de Moree’’, that accompanied general Maison. 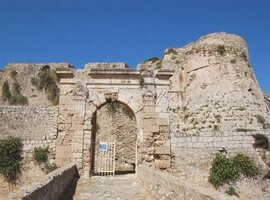 The entrance gate ends in a cruciform arch framed on the right and left by pilasters with Corinthian capitals. It is considered to be the work of the Venetians after 1700AC. On the right and left of the entrance, two large battlements can be seen. In the eastern part is the one building by general Antonio Loredan, during the second period of Venetian occupation. The towers are built with large limestone blocks and had some internal rooms. 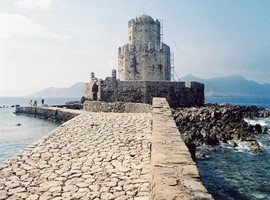 From the gate, a paved walkway over a small bridge leads to the small fortified islet Bourtzi. 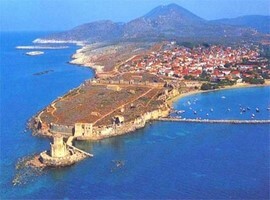 Here were massacred many soldiers and inhabitants of Methoni, when in 1500 the Turks occupied the fort. Bourtzi dates from the period after 1500 and was used various times as a prison. It is comprised of a two-floor octagonal tower. On each floor there is a parapet with crenellations. The tower ends in a circular dome. Downstairs, there was a tank and the whole building, with the least defensive significance, is dated in the first period when the Turks occupied the fort. There are great scenery’s all around the castle, tourists are able to understand how the designers used the surrounding nature to form a strong defence against their attackers. For comfort, it is highly recommendable to wear reasonable footwear especially if you intend to climb the various towers. As for the climate, avoid venturing in the midsummer sun as it will leave you exhausted. In addition, if you love taking pictures the beautiful scenery offers the perfect backgrounds so don’t forget to carry your camera. After completing your sojourn, there are a number of good restaurants just up the road which serve refreshments and food which usually go down well after a long day of adventure. 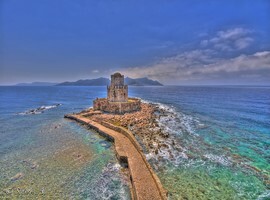 So when you are around Methoni, take a step back and visit this beautiful mythical castle.